Description: A distinctive, fantastic decorating idea for a home, retailer or hospitality location, this dual-function lighting/fan innovation features a custom design integrated with energy-efficient technologies. 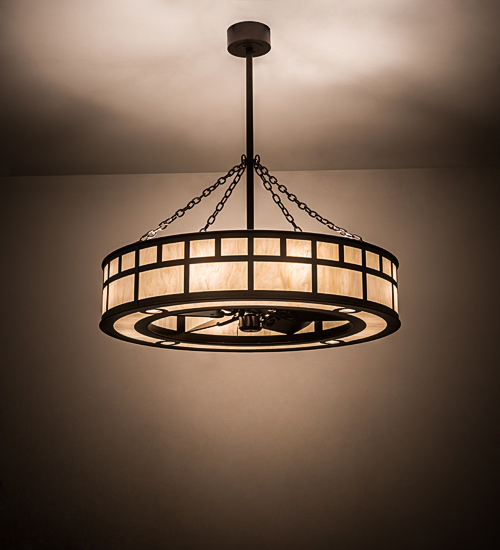 Stunning Creme Carrara Idalight is complemented with Mahogany Bronze finished hardware. 4 Customer supplied downlights provide task lighting, 4 Customer supplied uplights deliver ambient illumination, and 8 Customer supplied inner lights illuminate the Idalight diffuser. Handcrafted in the USA. In summer, the fan pushes down a windchill to keep the space cool and comfortable. In winter, the fan is reversed to pull the room air up towards the ceiling and force the warm air back down and circulate to create warmth. UL and cUL listed.